I haven't seen the sun in well over a week. In the DC area, we are living in a warm cloud. Other parts of the country have had tragic weather. I think it's time to think spring, and one of my favorite brands, Guerlain, came through for me with photos of their spring collection. They lifted my spirits with dreams of beautiful new treats - and immediately my wishlist grew. In 1987, Guerlain launched their Météorites: the first loose illuminating and color-correcting powder that came in the form of multicolored pearls. One stroke of the brush, and these pearls released a perfecting halo to bathe skin with light and glow with ideal radiance. There is no mistaking the enviable radiance of a women’s skin when she looks well rested, healthy, and vibrant. She has that certain "je ne sais quoi." For spring, Guerlain will reveal the secret to her ethereal glow with a joyful, luminous, and colorful 2016 Spring Collection. I haven't seen any of these products yet. They are due to launch in January. 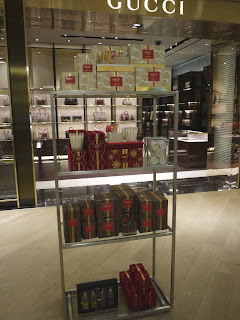 I'll be stalking the Guerlain counter! If I don't get a new job soon, I'll be shedding tears at the counter. The Météorites Primer ($74.00) is an essential skin-perfecting primer and ultimate radiance booster. Météorites Primer reveals correcting and perfecting pearls of light in a fresh gel formula. Mattified and unified, the complexion will be beautifully enhanced before makeup application. Here is what Guerlain has to say about this primer. Highly concentrated pearls containing multicolored micro-shimmer particles amplify light reflection to create a luminous, color-corrective halo of light for the face. Absorbent powders neutralize excess sebum, while a special polymer helps to fade imperfections and smooth fine lines for a long-lasting matte and even complexion. Enriched with the Météorites signature Stardust technology that transforms invisible UV light into visible and soft-focus perfecting light to blur imperfections and provide exceptional radiance. Météorites Voyage Powder Compact ($179.00), Guerlain’s most precious powder, features a universal shade comprised of five different micro-pearl colors to correct and illuminate all skin tones. These light, sheer powders bathe the skin in a veil of light, increasing radiance and luminosity. Hand-selected and weighed, the pearls are compressed to create a powder that perfectly fuses with the skin. 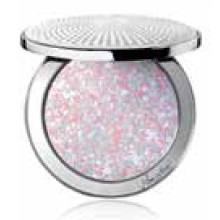 Its ultimate color-corrective shimmer, enriched with pink and white pearls, directs light to enhance facial features. The Météorites signature Stardust technology transforms the invisible UV light into visible and soft-focus perfecting light to fade imperfections and illuminate the face. Who can resist this stunning new jewel-like silver case adorned with such detail and artistry? To apply, sweep the Météorites powder with a brush by tracing a letter “G” formation to highlight the contours of the face. Or use your fingers or a sponge for a heavier application where you want to glow. Écrin 1 Colour Enjoy Long-Lasting Eye Shadow ($34) is a limited edition, and from the looks of it, it will also sell out quickly. Guerlain’s newest collector eye shadow is a stunning neutral buttercup yellow nestled in a metallic champagne case. It will be hard to resist. Worn solo or with a playful mix of color, your eyes will instantly be illuminated with a soft swipe of this irresistible shade. I think it will be one of your standby colors. Use it when you are in a hurry to open up your eyes, or use it as a base with other shades to create a customized look. With Le Crayon Yeux Water Resistant Long-Lasting Khol Liner ($31), Guerlain redefines the typical eye pencil and introduces its first-ever all-in-one liner and khol pencil with a water-resistant and long-lasting formula. With minimal effort, this gentle, creamy-smooth eye pencil will glide on with a seamless application. Whether going for a dramatic look or something a bit more natural, this new pencil and blending tip create beautifully defined and contoured eyes in an instant. There are five new shades: #01 Black, #02 Brown, #03 Purple, #04 Navy Blue (steady my heart), and #05 Khaki. 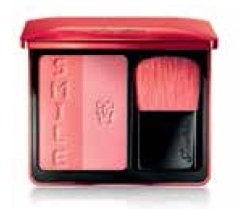 Rose Aux Joules Smile Blush Duo ($62) will be a limited edition. You can accessorize your makeup bag or vanity with this perfect pairing of blush shades housed in a chic metallic red compact and beautifully engraved with “SMILE.” To apply, mix the two shades to color the cheeks, or create contrast by using the satiny red shade on the cheekbones, while enhancing the cheek bones with the delicate pink shade for a glowing effect. I predict this piece will also sell out quickly. 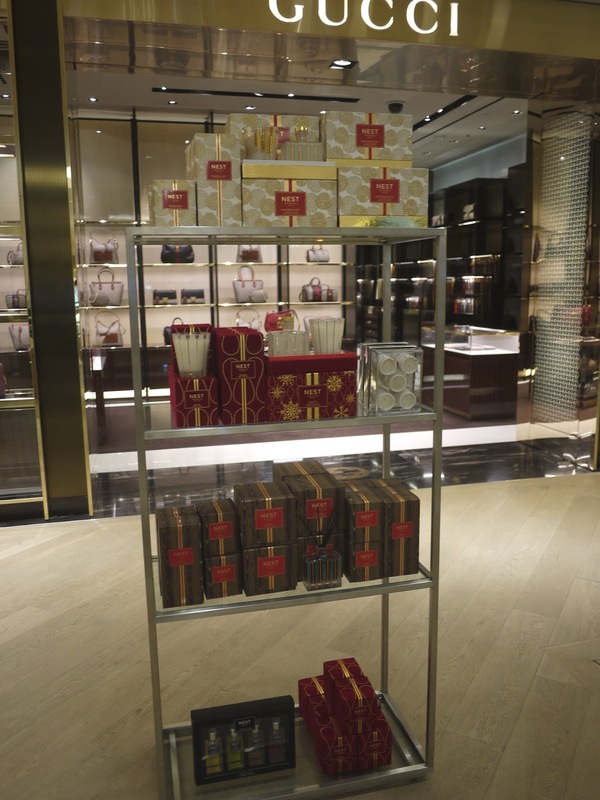 Guerlain's entire holiday collection was gone in an instant. You will have to be on your toes when these pieces arrive at the counter. KissKiss Lipstick ($37) is one of my favorites. Since its relaunch in 2014 (thank you, Guerlain! 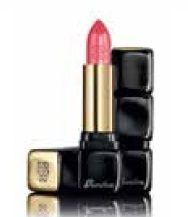 ), KissKiss lipstick has quickly become a beauty essential for me and the little black dress in any woman's wardrobe. KissKiss will welcome spring in two alluring shades: Darling Baby (#371), a light and luminous pink; and All About Pink (#372), a light and lustrous fuchsia that will create a very desirable pout. I love it because it's so hydrating. Additionally, I am seeing a very pink trend for spring. 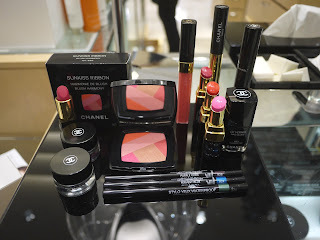 You will be able to find this collection beginning January 2016 at the Guerlain boutiques, as well as select in-store locations of Saks Fifth Avenue, Bloomingdale’s, Bergdorf Goodman, Neiman Marcus, Dillard’s, Sephora, Nordstrom, and online. Keep your eyes open! 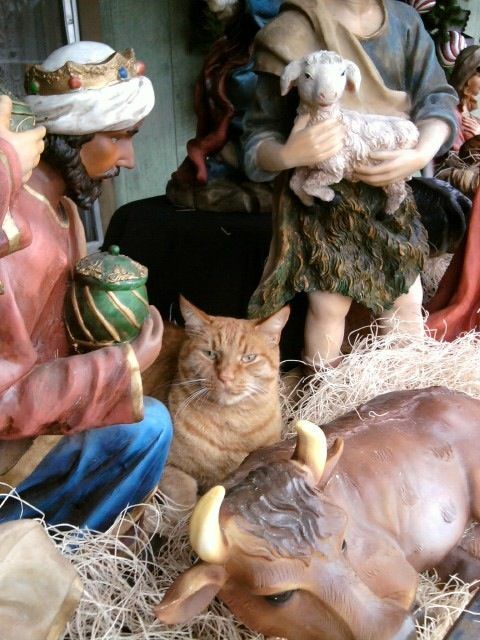 Every Christmas, I used to set up the nativity scene, arranging the characters perfectly. The wise men were arriving on their camels. The people and animals - along with the baby Jesus - were placed just so. As soon as I turned my back, a cat joined the scene. The figures were knocked over and spread from here to there, just so our little darling could be part of the action. It didn't matter which cat over the years; they all did it. Charlie doesn't get a Christmas tree. He's such a little devil, it would be tipped over in no time. Christmas Eve, a day of anticipation, last-minute preparations, or both. It's almost as magical as Christmas Day. When I was growing up, we trimmed our Christmas tree on Christmas Eve. My father would wire the tree to hooks on the baseboard so that it wouldn't tip over (say, if a Charlie cat decided to climb it), and we would drag out the ornaments - antique and new - to turn it from a beautiful tree into a splendid one. With the Nativity scene, cat, and all the packages under the tree, it was the focus of our living room until New Year's Day. I have hung my wreath on the door in memory of our family tradition. I had planned to feature new makeup over the last week, but we haven't seen the sun once. It is warm today, 70+ degrees, and destined to set a new record. However, it's cloudy and foggy. I have finished all preparations except for packaging gifts. I will start delivering them later today. Tomorrow, I will prepare the prime rib dinner requested by my mother. I think my greatest wish this year is for "peace on Earth and goodwill toward all people and animals." Wouldn't it be a wonderful world if 2016 could go by without wars, murders, terrorism, cruelty, and starvation? 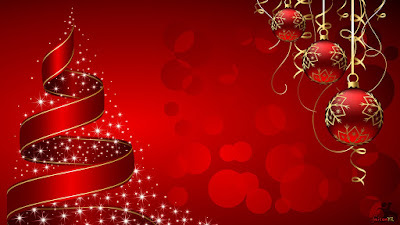 I wish you a wonderful Christmas or the holiday you are celebrating this year. 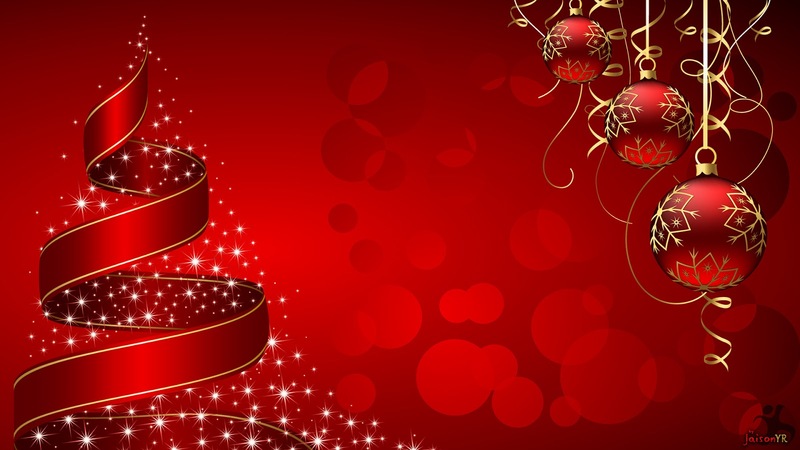 I hope this season is kind to you and your loved ones! 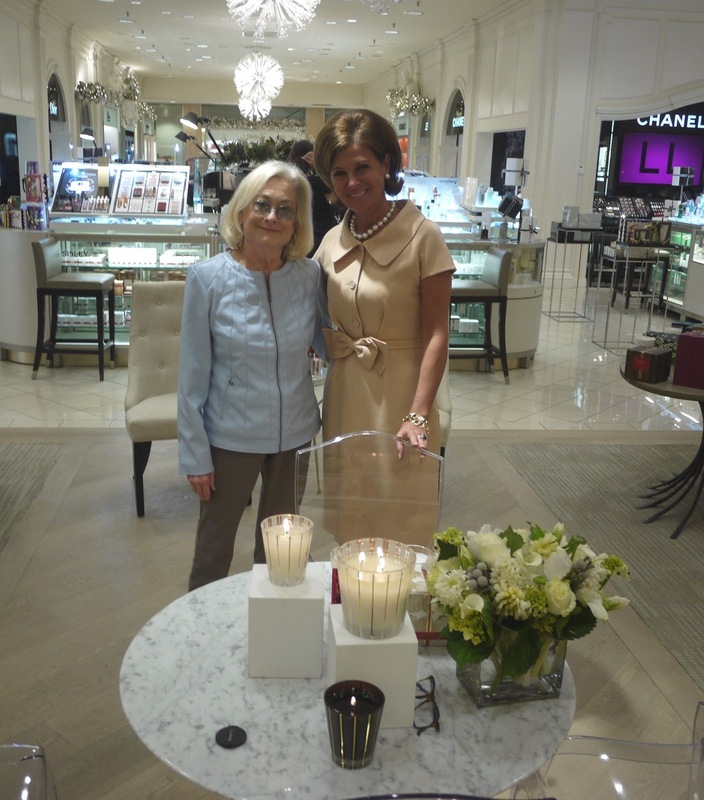 Last week, I had the privilege of meeting Laura Slatkin, founder and executive chairman of NEST Fragrances. 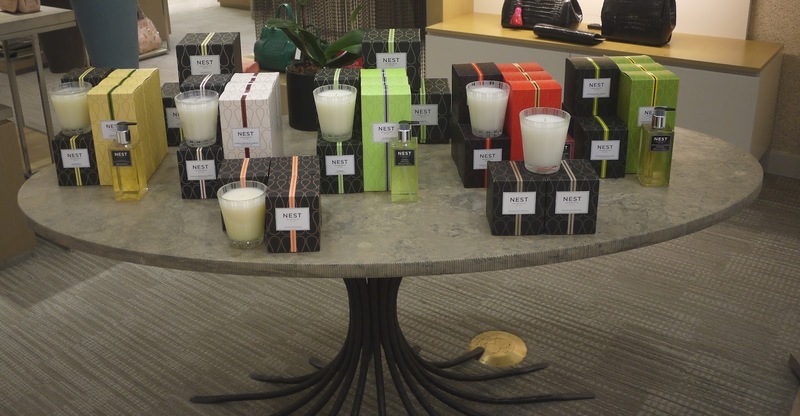 NEST Fragrances is a luxury lifestyle brand, offering a full range of fragranced products for the body, bath, and home. NEST is well known for its beautiful fragrances, high-quality ingredients, and exceptionally beautiful packaging. The photo above shows Laura with the members of her team who accompanied her to Saks Fifth Avenue, Chevy Chase, Maryland. That's Laura in the middle above, Doreen LaSala on the left, and Wil Galvez on the right. I am sorry my photo is dark. I've found it difficult to get shadow-free photos in that store. The holiday display (above) shows several of NEST's holiday specials. The red and gold velvet box is as gorgeous as the Classic Candle, scented with pomegranate, Mandarin orange, pine, cloves, and cinnamon with a hint of vanilla and amber. Birchwood Pine graces the top row. It will fragrance your room with the aroma of a majestic winter forest, created by a blend of white pine, fir balsam, and birchwood over a base of rich musk and amber. Hearth, shown below the Classic Candle, is woody. It combines rich oud wood with frankincense and hints of smoky embers. I have a friend in the beauty industry who has already purchased Hearth. He loves it! All of these fragrances are available not only in candles, but also in diffusers. Check out the NEST Holiday Boutique for more information. NEST products can also be purchased at Saks Fifth Avenue and Neiman Marcus. You will be surprised that NEST's beautiful scented candles, diffusers, soaps, and other offerings are very reasonably priced for luxury products. There were several other large displays of NEST's elegant products spaced around the room. My favorite was the flower arrangement above. The photo shows me with Laura. I wish I had thought to take off my sunglasses before Wil took this picture using my camera. The photo above shows the liquid hand soaps with a pump top that I can't live without. I have one at every sink in my house. I purchased a holiday special set of liquid hand soaps at a great price. I needed them! I've met many industry people during my years of blogging. 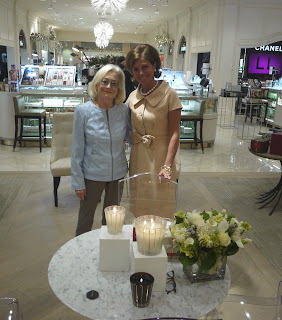 I want you to know that Laura Slatkin is one of the most gracious women I have ever met. She took time to sit with me and talk - not only about her company, but also our parents and our experiences as they aged. Talking with her was like talking to a best friend, and we had just met. She is absolutely lovely in every respect. I asked her about spring. What will be introduced? One fragrance called Corsica sounds like a must-have. Imagine a blend of figs with other Mediterranean scents. Heavenly! NEST's first four-wick candle presented in a porcelain-like oblong container can be used on the dinner table even after the candle has reached the end of its life. Just fill the container with flowers, and you will have an instant centerpiece. I am ready for spring - even though we are having spring weather this week. 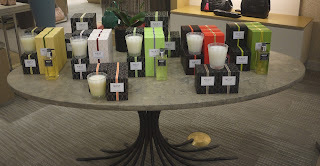 A NEST purchase will make a lovely Christmas gift or hostess gift. Or you could treat yourself. The friends to whom I have given NEST's products were thrilled. I want to thank Wil for inviting me to this cozy gathering. I had much fun with the NEST Fragrances team that night. They made me feel at home. Why Did I Disappear Again? No picture needed for this post. I started blogging again in October after I had recovered fully from my right knee replacement (that was two major surgeries in one year). I had been looking for a new job/consulting work - and I'm still looking. That is time-consuming. Then, a series of things happened. I had new knee problems. One was diagnosed as a pulled tendon below my knee, no doubt from lifting heavy things. My mother was hospitalized for eight days, and she is still ill. I try to see her every day. The CT scans showed multiple things wrong with her - one really serious that I don't want to talk about. I took her to a urologist last week in hopes of curing a lasting UTI. He is very good and put her on a new medication today. Cipro was not working. The culture told him why. I've been holding off on spinal epidurals, waiting for my favorite interventional radiolgist to return from heart surgery. My stenosis is painful! Miscellaneous events that took over my spare time. such as the moronic woman driving an SUV who ran into my car while I was pumping gas. I suspect everyone knows how time consuming it is to get an estimate, arrange with her insurance company to pay all damages, get and return a rental car - all things I didn't need in the last month. Without a job, I've been on a makeup diet. 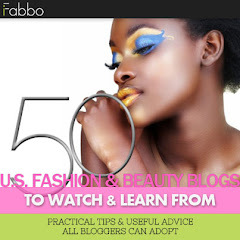 Unfortunately, as much as I love blogging, I had to put it aside until this weekend. In the last few days, I have spent retirement money on some new things, and I have had to take photos using store testers (in inadequate light). I can't buy everything I want without a job, and I'm reluctant to feature older things - although I might as long as you can still buy them. I think there is nothing worse than featuring a lovely product with the snide, "but you can't buy it" that other bloggers post. Since I decided to start blogging again this week, I got an "unsubscribe notice" that said the reader was dropping my infrequent posts because I didn't post often enough. That was a low blow. If she had known my circumstances, she might have checked "no longer relevant" and spare me the silent lecture. Anyhow, my willpower is back, and I plan to start showing you new features. The next one will be about NEST Fragrances - probably tonight - and I'll jump to Rouge Bunny Rouge from there. I feel I owe other companies for sending me gratis products to try during my recuperations. I love some of the products, and the PR people have been so good to me. 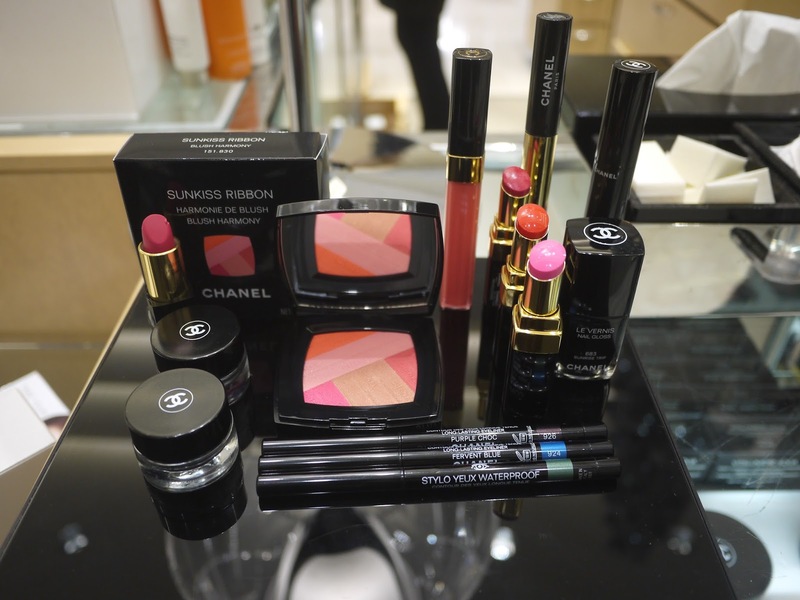 Part of Chanel's 2016 makeup collection has arrived at Neiman Marcus. The eye shadow quad will not arrive until January, I'm told. You can see it here. As you can see above, there is plenty to keep you occupied for now. The dazzling blush appears to be the centerpiece of the collection this month. There are three sheer lipsticks that drew my eyes immediately. 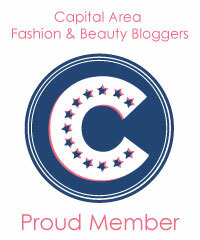 I love, love, love Chanel's sheers! I swatched the blush and three Rouge Coco Shine lip colors. The light outside was not ideal. The sun was struggling to emerge from behind the clouds. So my photos are not sharp (and really don't please me). I'm sorry, but since it's Christmas shopping season, I can't go back today. I might get crushed. The sheer lip colors are shown above. Mighty, #116, is shown at the top of my arm. It's a pastel pink that leans blue-pink. The pretty coral Shipshape, #114, is shown in the middle, with the beautiful rose Energy, #118, shown at the bottom. I love them all, but have a preference for Shipshape and Energy because they are more pigmented or more colorful. The blush, Sunkiss Ribbon, has a snazzy pattern (see above). I blended all of the colors together for my swatch, and a pretty peach resulted. The nice thing about the pattern is that you can easily choose to use the different shades alone or in combination for different color effects. There is more in this collection for spring, and I will feature the rest of the items - most likely in January. All in all, I think it's a beautiful collection that will have something in it for each of us to think spring during the winter. I apologize for my photos. They show what clouds will do, no matter how bright it is outside. I used them only to give you this quick look at the blossoming of a gorgeous spring collection. If you need to order by phone, you can call Nicki at Neiman Marcus Mazza Gallerie at (202) 966-9700 or Rahman at Neiman Marcus Tysons Galleria at (703) 761-1600. Ask the operator for Chanel Cosmetics. In my next features, I will explain where I've been and show you the stunning NEST Fragrances collection for the holidays.